As I stood there in the delightful morning chill composing this image, I was concentrating on the water trough that flows water from the creek (barely visible from camera left). Cursing under my breath that “how dare they put pavement so close to all this natural beauty!”, then I thought…wait a minute…exactly what am I looking at here? As you all know, learning to “see” can be a trying and tricky time…and as I reflected on how many different paths I have taken over these many years I realized…that no matter how numerous the paths, they all seem to end up placing me right here where I am. Like the snow that melts and travels down the road, down the water trough, and down the creeks, streams, and rivers…eventually to the ocean and then back up to the clouds. falling as snow and rain, to travel many paths right back to the ocean to start it’s journey all over again. Flowing down many different paths just to do it all over again while assuming different forms as liqied, ice, and snow. So as they say out west, “Happy trails to you”, and as each of us travel our many paths of life try to remember that while destinations are important, the paths you chose to get there….can be even more exciting than the destinations themselves. Just my two cents worth, hope this makes sense to those who need to hear this (like me!). Equipment used: Nikon D700, Nikkor 12-24mm 2.8 lens, Induro CT213 tripod, Induro BHD2 ballhead, and my trust Stanley thermos. As always, my images are copyright protected and available to you as wall art prints, wraps, and other merchadise. More info available on my “About” page. You can click on any of my images to see them in HIGH RES. Thanks for visiting! (note: if you click on the image to view it in HIGHRES, you only need to click the back button on your browser to return to this page). Equipment used: Nikon D700, Nikkor 12-24mm 2.8 lens, Induro CT213 tripod, Induro BHD2 ballhead, and my trusty Stanley thermos. This image is primarily “right from the camera”. I did add some contrast and a small amount of highlight recovery. 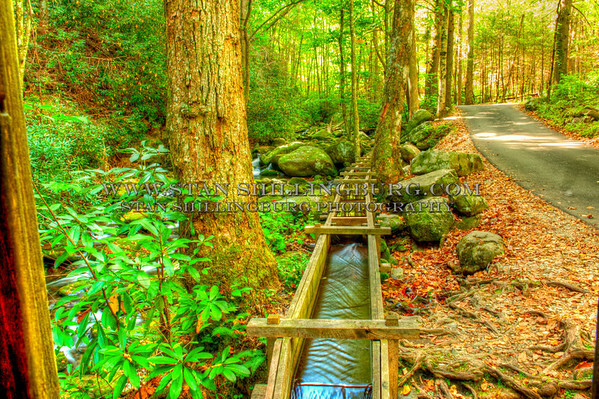 This will mark a break in my Great Smoky Mountains collection. However, I will be adding to this collection on my webpage if you would like to visit. I plan to add a little more diversity on my blog pages and for sure, I will be featuring more of this gallery on my blog pages in the near future! Since I purchased Nikkor’s 12-24 2.8 lens, I have been absolutely in love with it’s ability to capture such wide angles of view while maintaining is “corner to corner” tack sharpness. I am going to be heading out to try this lens in some of my Seascape images (keep your fingers crossed, the huge bubble on the end of this lens does not allow for any filter use). Just a little something different…trying a softer image style, hope you like it. Comments welcomed to your preference of sharp and clear, or allowing and enjoying the occassional use of a softer image style. One of my favorite things to do is to hike through the woods where the silence and solitude can be deafening. The sound of the wind blowing through the trees is a haunting reminder of small we are in totality of nature. The chill of the air stings our cheeks warning us that “old man winter” is on the way. The feeling of solitude fill our mind as we wonder about those that have walked the paths, stood by the streams, and lived through the harshness of nature’s frosty blanket. Behind me I can hear the roar of a waterfall. Setting up my camera and tripod for this shot, the animals surely thought I was crazy…moving from side to side, the forward and backward, until I finally found a spot I was happy with for the photograph. 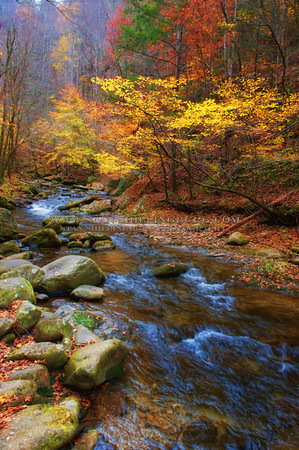 This shot was something I wanted to savor and enjoy…the rich warm colors of fall as they began to show themselves in the Great Smoky Mountains National Park. Chilly and misty morning in Gatlinburg, TN. 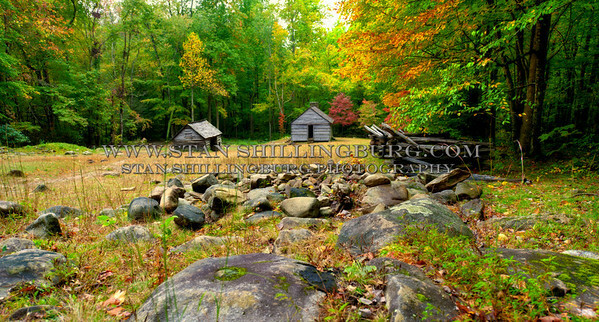 This old wood shed was ighlighte by the rocks, colors, and even the mist and trees. Drawing my eye and my lens to spend some time trying to capture it. Well, and a thermos full of coffee to ward off the wet chill in the air. Sometime even a wide angle lens cannot even come close to capturing all the splenor! Looks like I will be trying my hand at Fall Panoramas this year! 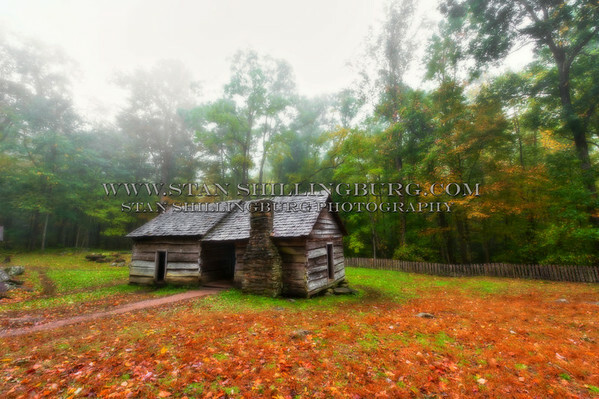 For more fall colors from Gatlinburg: you can click the link at the top of the page for my WEBSITE or, you can click on any of my image and go right to the HIGHRES version. 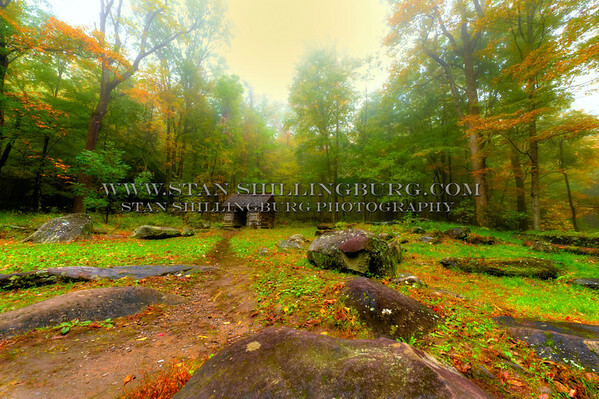 Or, you can go to http://www.stanshillingburg.com and click on my photography gallery. 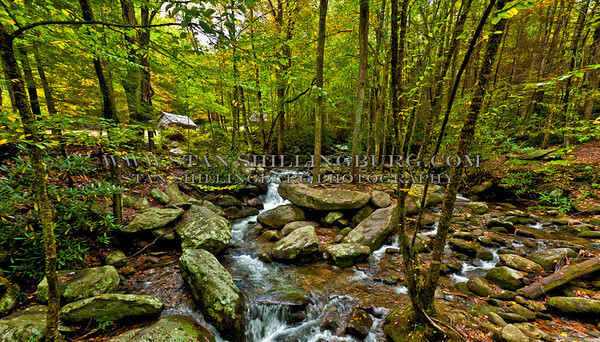 The Landscapes, Fine Art, and other galleries are available for your viewing pleasure!